Being active can help patients with failing hearts feel better—and it’s safe, according to the largest-ever study of exercise in people with chronic heart failure, published Tuesday in the Journal of the American Medical Association. 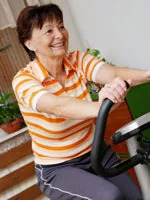 TUESDAY, April 7, 2009 (Health.com) — Moderate exercise can help patients with failing hearts feel better—and it’s safe, according to the largest-ever study of exercise in people with chronic heart failure, published Tuesday as two articles in the Journal of the American Medical Association. The study's results may not have been groundbreaking: Fewer than half of patients were fully following the recommended exercise regimen (the equivalent of brisk walking or stationary cycling for about two to three hours a week) by the end of the study, and the effect of exercise on mortality and hospitalization risk was small. But these benefits shouldn’t be dismissed, given the poor quality of life many chronic heart failure patients have, says Clyde Yancy, MD, medical director of the Baylor Heart and Vascular Institute in Houston. About 5 million people in the United States have chronic heart failure, in which the heart becomes too weak to pump blood through the body effectively. Not too long ago, bed rest was the standard treatment for these patients, who suffer from fatigue, difficulty breathing, and swelling of the legs, among other symptoms. But for the past 20 or 30 years, evidence has been trickling in to show that these patients can actually benefit from being active, says Kathryn E. Flynn, PhD, of Duke University School of Medicine in Durham, N.C.
To get a clearer sense of the benefits (and potential risks) of exercise for heart failure patients, Flynn—along with Christopher M. O’Connor, MD, director of the Heart Center at Duke, as well as colleagues from several centers across the country—randomly assigned 2,331 men and women with heart failure to one of two groups: standard medical care plus aerobic exercise training or standard care only. People in the exercise group started out with 36 supervised-exercise sessions, then were sent home with a treadmill or exercise bike and instructed to get 120 to 200 minutes of exercise a week. Within three months, Flynn and her team found, the exercisers said they felt better. “The average difference was modest, but it happened early," Flynn says. "And it persisted over time: 54% of the men and women in this group reported clinically meaningful improvements in their health status three months into the study, compared with 29% of people in the control group." After two-and-a-half years, the people in the exercise group were slightly less likely to be hospitalized for any cause or for heart failure. They were also at modestly reduced risk of death from any cause, as well as death from heart failure. Unsurprisingly, exercisers also were somewhat more fit than they were at the study’s outset. “I think this study really helps to show that when you look across a lot of different people, exercise is a good thing,” Flynn says, noting that past studies have included far fewer women and older people. Given that fewer than half of the patients in the exercise group were actually following recommendations for physical activity by the end of the study—par for the course with behavioral-intervention trials requiring lifestyle changes—Dr. O’Connor says he wasn’t disappointed that the benefits were small. “Really, it’s quite remarkable in my opinion that we found these modest improvements," he adds. When O'Connor and his colleagues broke down the results based on how well people were sticking to the exercise recommendations, an analysis not published in the JAMA paper, more striking differences emerged. “The more you did with greater intensity, the greater benefit,” Dr. O'Connor says. It’s also important, he adds, that the research was able to confirm that exercise does not carry risks for people with stable heart failure. “It was not known that it was safe with this degree of certainty,” Dr. O'Connor says.